"…helping men help themselves and break the cycle of homelessness…"
Two weeks ago, we had our first annual staff luncheon. Brent, our Executive Director treated the men to a Tex-Mex lunch at “On the Border” restaurant. He also provided gray hoodies with our logo for each man. All the guys (except Brent) graduated from our 6 month substance abuse program. Their sobriety longevity ranges from 2 years to 9 ½ years. In the first row is Ray, our operations manager, Gary, our warehouse manager, Boyd, our maintenance manager, Brent, Rick, our kitchen manager, Josh, our intake and case manager. In the back row is Allan, our dispatch manager, Reggie, our Assistant Director, DeWayne, our Recovery Program Director and Andrew, our recovery manager. Thank you guys for all you do! What happens in Vegas, comes to Soul’s Harbor. Last month, we welcomed the Las Vegas Lake Mead Christian Academy. They spent an evening with us. We gave them an overview of our mission, talked about our rich 60+ years’ history and fed the entire group. Thank you to Urban Plunge for setting this up. Urban Plunge is a Christian outreach organization that takes Church groups to the inner-city to experience social service agencies that assist the homeless, children, and the elderly. We look forward to our next church group from Urban Plunge. Soul’s Harbor homeless shelter is supported solely by our four thrift stores. You can donate your household items via phone (972-286-1940) or our “Household Donation Request Form” page. We also take automobiles “Vehicle Donation Request Form“. So if you have old clothes, furniture, appliances, household items, or even a car to donate to Soul’s Harbor, either fill out our online form or call our dispatch office at 972-286-1940. Our dispatch office is open Monday through Saturday from 7:00 AM to 6:00 PM. We are sustained solely through our four thrift store sales. We rely on your donated items to support our shelter. At Soul’s Harbor, we would like to thank all our customers that donate their items and also our thrift store customers. 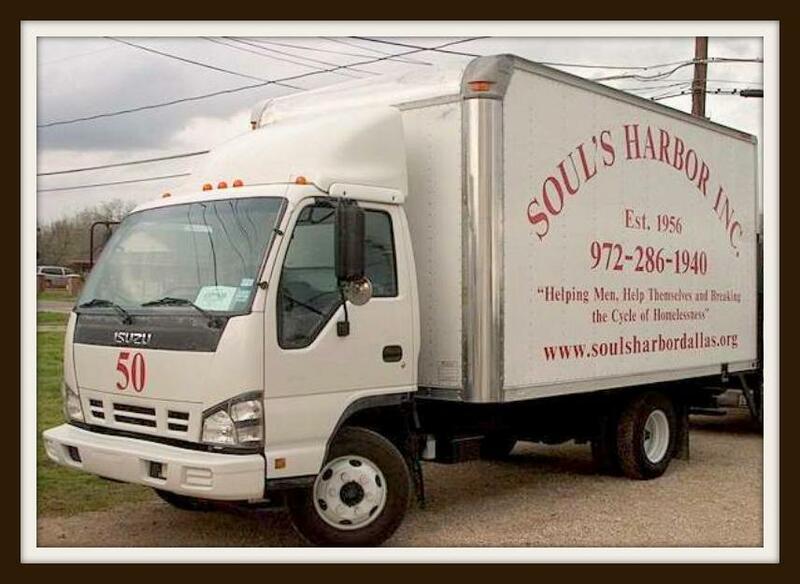 Because without our customers, there would be no Soul’s Harbor. Thank you so much for your financial consideration. Note, your tax-deductible contributions may also be submitted through PayPal to gro.s1555899479allad1555899479robra1555899479hsluo1555899479s@eta1555899479nod1555899479. *Please note: Users of Internet Explorer 8 and above may experience difficulties with our PayPal “Donate” button. Please access PayPal directly to make a financial contribution to Soul’s Harbor, Inc. Thank you!